The death was announced on 1st February of Jerry Hicks MBE, at the age of 86. He was an indefatigable campaigner, who helped save Bristol’s Floating Harbour from being concreted over, in what became known as the Battle for the City Docks, and also prevented the despoilation of the Avon Gorge by the proposed building of an hotel and car park adjacent to the Clifton Suspension Bridge. A successful artist who trained at the Slade Art School and had an exhibition at the Royal Academy, he moved with his wife Anne to Bristol in 1951. 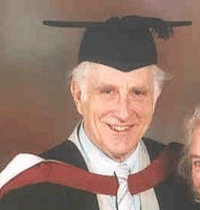 He was an inspirational teacher and created a strong and free-thinking Art Department at Cotham Grammar School. As a Judo black belt, he helped popularise the sport in the UK and set up a week’s celebration of it in Queens Square, to coincide with the 1964 Olympics. He was a member of the Central Council of Physical Education and the South West Sports Council. His persistence resulted in special protection for greenfield sites (in Planning Policy Guidance 17) and he was also instrumental in the requirement that all children at Key Stage 2 be able to swim 25 metres. In recognition of his services to Sports and the South-West, he was awarded the MBE in 1994. A former executive member of Bristol Civic Society, he spoke powerfully in defense of Bristol’s heritage. He was a leading member of the Bristol City Docks Group, formed to fight for the ratification of the Parliamentary Act in order to maintain the use of the docks both by smaller vessels – yachts, dinghies and launches – and by tall masted ships coming up the river and tying-up in the centre of the city. The success of the Group’s campaign can be seen when you visit the docks today and see the number of boats moored, with the SS Great Britain and the Matthew having pride of place. The height of the M5 crossing the Avon near its mouth was also made sufficient for tall ships, which have visited the city frequently in recent years, to make successful passage up the Avon from the Bristol Channel. In the words of Mayor George Ferguson, he leaves his city a better place. He is survived by his wife, Anne, and their daughter.